So, What Makes Up Quality Marine Binoculars? Before you hit the stores or log on to the internet to purchase your binoculars, you should familiarize yourself as to what features you should be looking for. Most every quality pair of binoculars are designed and sold for a specific use and this applies also to marine binoculars. While many different types of binoculars share some common features, many features are unique to the use envisioned. While most mariners would agree that being waterproof is a must have feature for use aboard a boat, for use at the opera or rock concert; probably not a top priority. Below we will talk about the different qualities that make up a good pair of marine binoculars and provide you a simple check list of what to look for. While at first it would seem that the higher the magnification the better, the truth is that with higher magnification comes a reduced field of view (FOV). This reduced FOV makes it difficult to near impossible to locate or keep an object in view when bouncing around on the water, some Image Stabilized Binoculars being the exception. 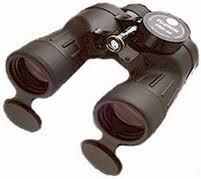 Most professional mariners tend to agree that 7x is about the upper limit for non-image stabilized marine binoculars. This provides the best trade off of power versus FOV that can be handled aboard a rolling boat. This is the second part of the number we were talking about above; 4x40, 8x32, 7x50, 10x40. It tells you the size of the objective lens (front lens) in millimeters. In the case of binoculars marked as 10x40, you can decipher this as having an objective lens size of 40 millimeters in diameter. The objective lens size indicates how much light the binocular can receive and how bright and clear the viewed image will be. In simple terms the bigger the better. This becomes especially important in low light situations such as night time use. Keep in mind though, that the larger the objective lens is, the larger and heavier the pair of binoculars will be. For marine use the commonly accepted objective lens diameter is 50 millimeters. This provides what many believe to be the best trade off of size versus light gathering ability. The wet and damp marine environment makes waterproof binoculars one of the most important features required for marine use. It is important to remember 2 things about waterproof binoculars: "weatherproof is not waterproof." and "water resistant is not waterproof." Unless your binoculars are completely sealed, moisture will eventually get into the interior of the binoculars. You should look for only those that are totally ’O’- Ring sealed as well as nitrogen filled / purged. This will ensure that you binoculars remain waterproof and prevent fogging of the interior glass during temperature changes or even if they become completely submerged to a reasonable depth. Individual eyepiece focus is the standard for waterproof / sealed type marine binoculars. Individual eyepiece focus simply means that you focus each eyepiece to the appropriate eye. To do this, look at something in the distance, close your right eye or cover the objective lens and focus the left eyepiece until the image you are looking at is clear and sharp. This is your eyes diopter setting. Repeat the procedure for your other eye. Your binoculars are now focused for your eyes and will be in focus from approximately 25 yards out to infinity. Once you have focused your binoculars to your eyes they will not need to be focused again unless the diopter settings are changed. It is good practice to remember your particular settings, this will allow you to quickly refocus your binoculars by simply lining up your diopter marks and the binoculars will be set once again for your eyes. An additional plus for this type of focus adjustment is that many people who wear glasses can adjust the diopter settings to allow them to use their binoculars without prescription glasses. Center focus systems tend to be more all-purpose than individual focus eyepieces. It allows you to quickly adjust the focus when viewing objects at short distances. It is rare to find marine binoculars using a center focus system. The primary reason being is that they are much harder to waterproof to marine standards. If you hold binoculars about a foot from your eyes, you will see a bright circle of light in both eye pieces, this is Exit Pupil. Since the human eye pupil diameter in dark conditions ranges between 5 and 8 millimeters depending on age, it is best to select binoculars that have an exit pupil equal to or greater than the pupil diameter of your eye. This provides the eye with the greatest amount of light transmission. To determine the Exit Pupil of any pair of binoculars simply divide the objective lens diameter by the magnification or power. 8x40 would have an Exit Pupil of 5mm while 7x50 would yield 7.1mm. This case is ideal for full size binocular storage. It is water and air tight and provides over 20# of bouyancy.